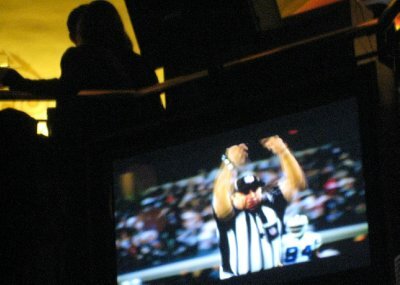 SPQR: Superbowl Party Quakes Rome! 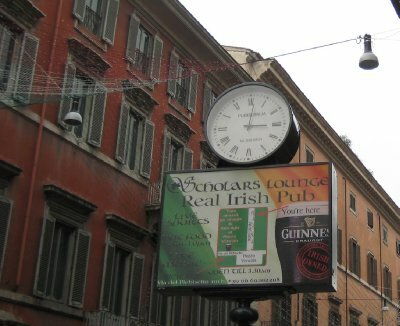 "I don't think I have heard this much English since I arrived in Rome!" I overheard that as two people squeezed passed me through the pre-game throng. The place was packed with Americans, mostly students. Despite the fact that it was getting close to midnight on a Sunday night, the crowd continued to grow and showed no signs of easing up. 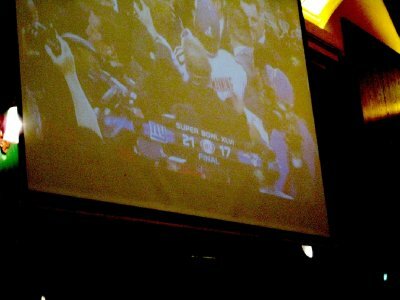 The reason they were there, and that late on a Sunday, was for Superbowl XLVI, and the place they were gathering was the Scholar's Lounge on the Via del Plebiscito in Rome, Italy. 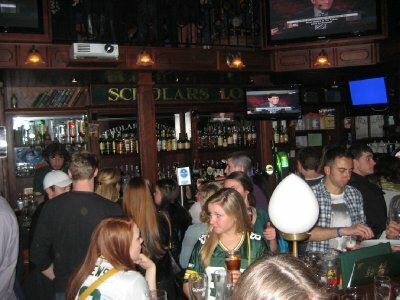 The Scholar's Lounge is a multi-room Irish pub with a fine selection of beers on tap and an international menu. It is as one imagines an Irish pub should be - wooden paneling, pictures of Irish poets, books lining book shelves and lots of whiskeys lined up behind the bar along mirrored shelves. 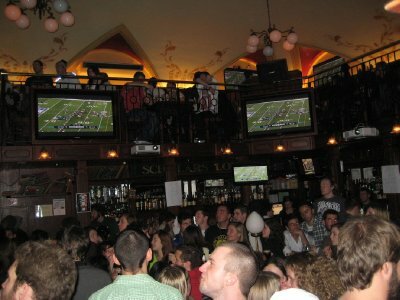 It also, in the manner of many pubs nowadays, had multiple TVs to show all the latest sports, including American football. 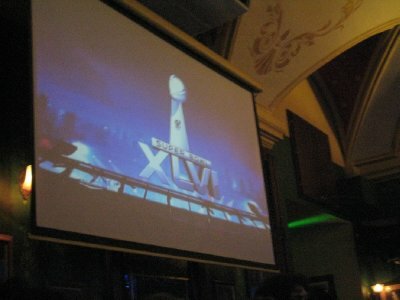 Superbowl XLVI featured the New York Giants against the New England Patriots, playing in Indianapolis, Indiana. 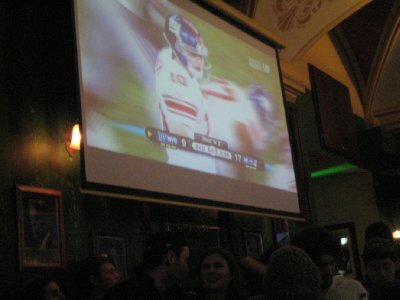 The Patriots were heavily favoured, however the New York Giants had beaten a heavily favoured and previously unbeaten Patriots squad in the Superbowl in 2008. As we got closer to midnight, the cramped quarters became even more packed, and I had to fight to find a space just to stand. Soon every inch of floor space was filled with people watching the Superbowl. Getting to the bar became a chore, having to try and push through the crowds. 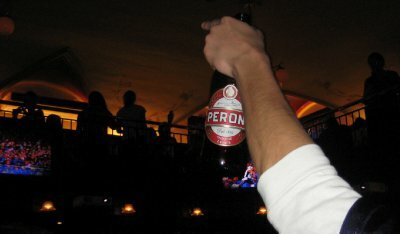 At half-time, I switched from pints to bottles of Peroni, and ordered three large bottles so I could try and make it through Madonna's half-time show and through the end of the game without having to try and fight my way back to the bar. Luckily I was able to find a small space, which even included a small shelf to put my extra bottles on and provided a decent view of on of the big screens. Despite the crowds, the Scholar's Lounge was a great place to watch the game. It had an excellent atmosphere, lots of fans and a beautiful setting. A few less people might have made getting to the bar a bit easier, but one can't complain too much. The game came towards the end with the Giants having the ball. Afraid that New York would run down the clock and kick a game-winning field goal, the Patriots allowed the Giants to score a touchdown run, giving the Patriots 57 seconds to try and win the game. However, the Patriots were unable to move down the field, and the Giants ended up winning the game 21 points to 17. My own game plan worked out well as well. I was able to run through the entire second half without having to go back to the bar, and as the game ended still had half a bottle of Peroni left. The crowd thinned out as the lights came on and I finished off the last of my beer. I walked out into the cold Roman night, wandered past the nearby Palazzo Venezia, up the street past the Trevi Fountain and back to my hotel. Another exotic location to watch the most American of events in an Irish pub. 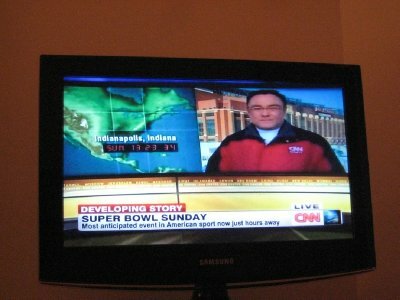 For more of my experience of watching Superbowl in international locations, check out my Superbowls Around the World Table of Contents.